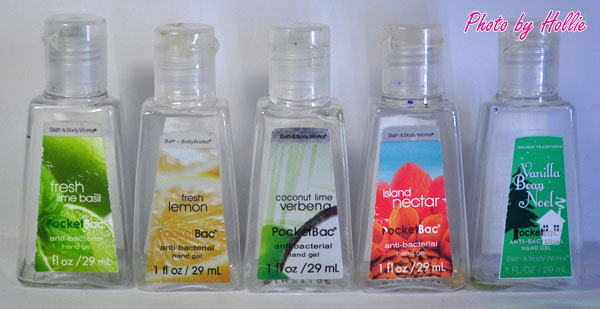 I've simply been hooked with Bath & Body Works PocketBac hand gel sanitizers this year, I can't count how many bottles I've emptied out but did find a few in my stash. I just love these anti-bacterial hand gel sanitizers because they smell divine. There are times that I feel like I don't need to put on cologne or perfume anymore, since the scent of this sanitizers quickly fills any room when I apply them on my hand. Since I already emptied out my PocketBacs, I had to buy new ones. I opted to buy from the Donut and Lunch Box Collection. So far, PB & J from the lunch box collection is my favorite out of the new ones I got. It smells exactly like Peanut Butter and Jelly. 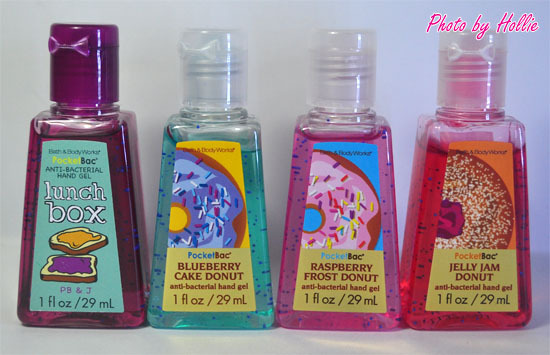 As for the Donut Collection, I find the smell overwhelming since it smells too sweet. Just in case you are wondering, I bought these online because they are much cheaper compared to those sold at local department stores. Who else is hooked on these Bath & Body Works Pocketbacs? What are your favorite scents?